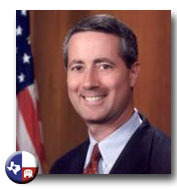 A fifth generation Texan, Mac Thornberry has strong ties to the people he serves in the U.S. House of Representatives. Mac is a lifelong resident of the 13th District of Texas. His family has been ranching in the area since 1881 - a family business in which Mac remains actively involved. Mac shares the values of the people he represents and continues to fight for the things that are important to them. He is a longtime advocate of lower taxes and limited government. Boosting domestic energy production, protecting private property rights, and reforming health care are top priorities for Mac. And, as one of the few Members of Congress personally involved in agriculture, Mac understands the challenges agricultural producers face and has been a key player in efforts to support them. Mac has established himself as a leader on national security. He currently serves on the Armed Services Committee and the Permanent Select Committee on Intelligence. Mac was one of the first in Congress to recognize the need to confront the threat of terrorism. Six months before the tragic events of September 11th, 2001, Mac introduced a bill to create a new Department of Homeland Security, which formed the basis of legislation signed into law by President Bush 20 months later. Mac has also played a major role in shaping national policy on transformation of the military and strategic nuclear issues. He is at the forefront of efforts in Congress to protect the country from threats ranging from terrorist attacks to cyber intrusion. For more on Mac's work on national security click here. Born in Clarendon and raised on the family ranch in Donley County, Mac graduated from Clarendon High School before continuing his education at Texas Tech University. After obtaining a B.A. in history from Tech in 1980, he went on to the University of Texas Law School where he graduated in 1983. For the next several years, he worked in Washington, including serving as Deputy Assistant Secretary for Legislative Affairs in the State Department under President Reagan. In 1989, Mac joined his brothers in the cattle business and practiced law in Amarillo. Mac's wife, Sally, is also a native Texan. They reside outside Amarillo in Clarendon, TX and have two children.